Roughly 10 million points of genetic variation are scattered across a molecule of DNA, and those variations make us who we are as individuals. However, in some cases, those variants contribute to diseases, and it's a major challenge for scientists to distinguish between harmless variants and those that are potentially hazardous to our health. The new method allows researchers to create sets of DNA variants in a single day for a few hundred dollars—which could eliminate current methods that take up to a week and cost tens of thousands of dollars. Previously, scientists laboriously tested the effect of genetic variants one by one. At a single point in the DNA sequence, they replaced the correct DNA letter—an A, T, C or G—with one of the other three options. Then, they translated that DNA sequence into a protein and evaluated whether the mutated protein behaved differently than the original one. 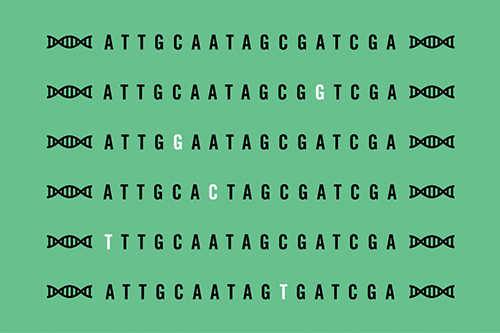 In recent years, researchers have begun creating sets of hundreds of variants in which each letter in a particular DNA sequence is changed, and then testing the set all at once. Such studies have been limited, however, by the high cost of creating those sets. The WUSM team realized that they could could harness common laboratory techniques and tools to create sets of DNA variants without the expensive equipment and reagents that drove up the price. The scientists copied a DNA sequence using the four standard DNA letters and a nonstandard letter known as inosine. Each copy of the sequence was identical except for one inosine, which was located at a random spot and served as a placeholder. Then, the team replaced the inosine with one of the standard DNA letters, creating a single mutation in each copy of the sequence. The investigators are looking to apply this technique to genes associated with aortic aneurysms, a weakening and ballooning of the aortic wall that can be fatal. Over the long term, the scientists envision the creation of a catalog listing the effects of every possible variant—a scenario that is now feasible due to the speed and cheapness of the new technique.